Broken Spoke Bike Co-op | We rode our bikes to Standon Calling festival! We rode our bikes to Standon Calling festival! So wrote William Vallans in 1590 (or thenabouts), employing some free-jazz spelling techniques to begin his epic Tale of Two Swannes. The cry goes up from those harbouring reasonable expectations of a blog post about cycling to a festival, “Why in Kanye’s holy name am I reading this poetry nonsense?” Fear not! For the unwitting targets of Vallans’ orthographically unorthodox lyricism, the very hils & medowes of which he warbled, are those lining the glorious Lea Valley, through which we did saunter bicyclically towards Standon. 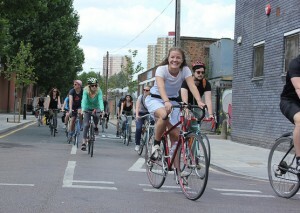 That’s right, we rode our bikes up the River Lea to a big ol’ sunshiney music festival. And right here, right now, you can read all about it – and I’ll try not to write like a parody of a 19th century literary dandy any more. Starting the day with the sunrise is often a lovely experience. A big beautiful cloudless sky, a bangin’ view from a balcony on the edge of the Olympic Park in Stratford, a day of riverside cycling ahead of us, fresh strawberries & fresh coffee on the kitchen table… lush. We enjoyed our breakfast, fairly sure that as the community van clattered, popped, and fuel-stank its way from Oxford through the Friday morning London traffic mosh pit, driver Andy and navigator Sue were feeling the same sense of calm and relaxed anticipation. A motley crew of bicycle pioneers assembled on Monier Road in the morning sunshine. Bags and tents were tagged and chucked into the back of the van, route cards handed out, happy introductions and glad re-acquaintances were made. A little safety talk from Sam and we’re off! It was a great lunch! Quenched with beer, re-ignited with coffee, we hit the road again. A brief and inglorious encounter with a proudly stereotype-enhancing white van man(iac) could not puncture our fine mood. A front derailleur decided it had had enough and detached itself from its bicycle, yet Sam’s mechanical prowess quickly turned the 10-speed into a 5-speed and we rumbled on past the weirs and brambles. Rejoining the roads at Ware, it was time to fight the metal hordes again, including yet another van-hooning malefactor whose too-fast, too-close, too-aggressive overtaking “technique” left me a gibbering roadside wreck. Much love to the kind riders who stopped and stretched and deep-breathed with me until the anxiety had passed! A fine illustration of the humanity of cycling vs the insanity of motoring. Onward into the country hills, until eventually o’er the treetops we saw the red-and-white stripes of the big top, and knew we were almost at the festival. A bit of mucking about and finding the wristband exchange and we were in! 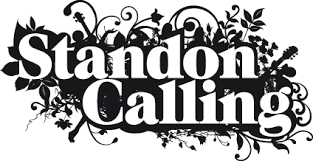 Standon Calling had agreed queue-jump and free drinks for people who cycled to the festival, which were very welcome! Tent setting up, beer-can opening up, luggage redistribution, and the fun could begin as we settled in for a weekend of glorious sunshine, great music, and high old times in the grounds of Standon Lordship. Some musical highlights of the weekend (for me) were Little Dragon, Hypnotic Brass Ensemble, Seinabo Sey, Roots Manuva, and Basement Jaxx; other wonders I encountered included the amazing Voodoo Zulu Liberation Taxi by the Treatment Rooms radical art collective, the fantastic Bhangra Bus café, and the Dig It! bicycle-pulled sound system. Monday morning brought heavy hearts (and hangovers), but the sunshine shooed them as we cycled through beautiful country lanes back to the river. A headwind tried in vain to resist us all the way back to London, but in the end we all made it, with some nice solidarity in forming mini-pelotons/windbreaks. OK, here’s the wrap-up. 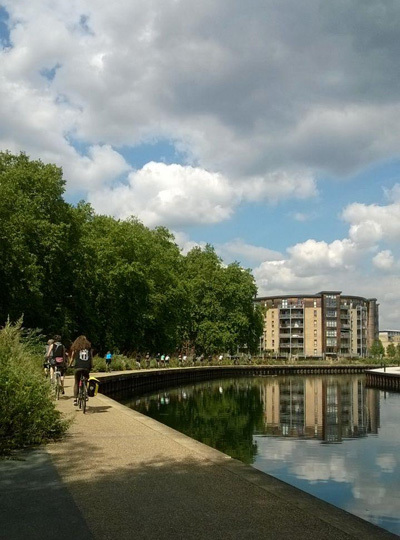 Cycling to a festival is great – you meet lovely people, avoid the traffic-queue stress, and depending on where the site is, maybe you get to cycle up a blooming beautiful garden-river. With the Broken Spoke providing a luggage service, you can just carry what you need for the ride and meet your tents/bags at the other end. After this excellent success, we hope to expand our festival-cycling operations, so – see you in 2016!